Jihad Watch : Even though the Islamic State is largely gone from the area. Christian leaders say Iraq’s monasteries and churches could soon become mere relics unless something is done to curb the violence against Christians The violence against Christians is ubiquitous in Islamic states, not just in Iraq. But in Iraq the situation is critical: The Armenian Embassy in Iraq estimates about 13,000 Armenians remain in the country. Before US-led forces invaded Iraq in 2003, the Armenian population stood at about 25,000. BAGHDAD — Christian leaders say Iraq’s monasteries and churches could soon become mere relics unless something is done to curb the violence against Christians. During an Aug. 26 press conference, Syriac Catholic Patriarch of Antioch Mar Ignatius Joseph III Younan described Christians as “the most targeted and most vulnerable” minority in the region — and not just because of the Islamic State (IS). This comes as Iraqi Christians in general, and Armenians in particular, prepare for the post-IS phase. Many of those who were driven from their homes in the Ninevah Plains are deciding whether to return. On Aug. 9, Iraqi Minister of Culture, Tourism and Antiquities Farid Rwandzi received Armenian leaders to discuss promoting their community’s cultural activity. In June, the head of the Armenian Apostolic Church in Iraq, Archbishop Avak Asadourian, and representatives of Armenian committees and groups visited some of the liberated villages and towns of Ninevah, including Aghajanian, one of the areas IS had occupied since 2014 after either killing or forcing out its residents. Now that IS is gone from the village, there’s a possibility that Christian areas in the plains could be included in the controversial Kurdistan Regional Government independence referendum scheduled for Sept. 25. However, on Aug. 27, the Assyrian Democratic Movement, which is Christian, called for steering the Ninevah Plains clear from the conflicts and keeping the area out of the referendum. Amid the long-term threat of violence, the Armenian population in Iraq has significantly declined. The Armenian Embassy in Iraq estimates about 13,000 Armenians remain in the country. Before US-led forces invaded Iraq in 2003, the Armenian population stood at about 25,000. Since IS took over Mosul in 2004, “the number of Armenians has completely receded in Mosul; not a single Armenian remains,” said Adnan Haider, the editor-in-chief of Bashtabya news agency, which regularly covers minority affairs. 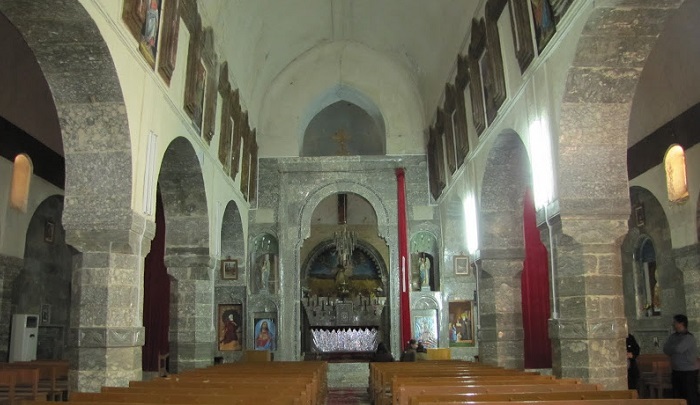 As Armenians came to Iraq centuries ago, some settled in the south and have had dioceses in Basra since 1222. Their numbers reached 37,000, most of whom settled in Baghdad in al-Batawin area and in the areas of Camp Sarah. Muslim minority activist Mudrek Hussein, the director of relations for the Armenian Relief and Development Association in Basra, has witnessed firsthand how the rights of the Armenian community in Basra have been quashed. Politicians “used legal tricks” to turn a centuries-old Armenian club into a shopping center, Hussein told Al-Monitor, adding, “The [Armenian] cemetery has shrunk to about 5,000 square meters [1.2 acres], all of which is destroyed graves now.” However, though the Armenian presence is receding, it’s still reflected in current symbols, most notably the Church of the Sacred Heart, the Church of the Virgin Mary and the Armenian Church in Baghdad, which is more than 100 years old. Given Armenians’ lengthy history in the region, a Christian Armenian said, on condition of anonymity, “Iraqis should no longer look down on Armenians as strangers.” Khajak Vartanian, the head of the administrative committee of the Armenian community in Basra, told Al-Monitor recently by phone about “the absence of projects reserved for Armenians by either the government or the Christian endowment.” There are so few Armenians left, he said, that national ID cards don’t even include “Armenian” as an option anymore. “In the old Basra area, for example, there is only one Armenian family left,” he said. Although Vartanian claimed Armenians “are not included in the parliament quota like other minorities,” Christian parliament member and rapporteur Imad Youkhana denied this. Youkhana added, “The Iraqi parliament’s decision to recognize that Christians in Iraq are being subjected to genocide also includes Armenians. … Armenians have the right to promote their [culture] and as a result of their [help], the Syriac language is being taught in Christian schools in Kirkuk.” Abdul Rahman Alloizi, a parliament member representing Ninevah, told Al-Monitor, “Armenians lived in Iraq in peace with the rest of Iraq’s sects, and the Iraqi constitution has approved the use of the Armenian language as a mother tongue.” Alloizi added, “There is a current opportunity for displaced Armenians to return to their areas,” which was demonstrated in July, when a new church was built in Ankawa in northern Iraq. Remember the Sulu Invasion of Sabah?